For your shopping convenience, Summit Jewelers offers a layaway program beginning at 30 days, which can be extended up to 90 days depending on the purchase. There is no service fee, and only a minimum of 10% down payment is required to secure your layaway plan. See our in-store representatives for assistance. A perfect gift for the jewelry lover in your life, the Summit Jewelers gift certificate is available in any denomination. See our store representatives for details and purchasing options. 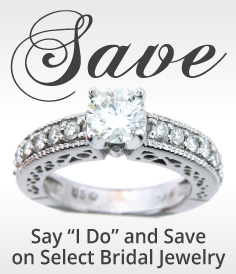 Summit Jewelers offers free appraisals for merchandise purchased in our store. For a fee, we can also provide appraisals on jewelry purchased elsewhere. Jewelry must be presented in store for estimates. Summit Jewelers accepts MasterCard, Visa, Discover and American Express credit cards. Summit Jewelers offers a secure shopping experience and provides a 14-day exchange or store credit policy for all purchases made in our store. Returned items must be in original condition. We do not offer refunds at this time.